Getting to see the big picture about customers and buyers today is not easy. It can be like sitting in an old stadium trying to peak around a su_column to see the field. When you cannot see the whole field, you are missing the action. With buying behavior changing rapidly each quarter, not having the big picture on the actions of buyers can set back an organizations significantly. In part one and two of this series, I reviewed the use of Buyer Persona Stories and Buyer Persona Scenarios. These powerful techniques allow you to build the chapters of your buyer’s complete end-to-end story. Getting to know the sub-stories and the important buying scenarios of your buyers in order to shape an effective content strategy and content marketing plan. Having a big picture means having not only a good visual but also good contextual understanding. Buyer Persona Story Mapping™ helps to provide a visual backdrop as well as the situational contexts needed to understand buyers today. Like a collection of short stories, this mapping technique allows us to gather the goals, activities, key moments, stories, and scenarios of buyers into a story-mapping framework. 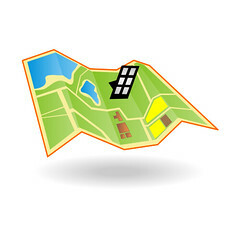 When we can map the stories of our buyers, they allow for teams to work on the big picture. While this modeling framework has multiple uses, the focus in this series has been on content marketing effectiveness. Teams can be free of the business jargon and frame of references, which can hinder content creation. And, get focused on the practical stories of buyers. Buyer Personas: this is our target character in our buyer’s story. A good place to note you may need to complete a story mapping for each buyer persona derived from buyer insight research and buyer persona development. Persona Buying Cycle: the purpose here is to introduce the important element of time. Like all good stories, there is a timeline. This view helps us understand the top-level epic story in play. There are other views also which can be used. Shortened or lengthened. My comment on the fervor around buyer’s journeys is rather than focus on the increasing “battle of the buyer’s journey”, focus on what takes place below the timeline. Buyer Persona Goals: as has been reiterated throughout this series, the core essence of buyer persona development is buyer goals. A goal driven mapping process helps us to understand what buyers are trying to accomplish as they progress through time, activities, and situations. Buyer Persona Activities: we want to highlight key activities and actions taken as buyers move along a timeline and identify the actions taken, which move them to the next stage or part of their buying cycle. Buyer Persona Stories: this technique, as shared in part one, allows us to focus in on how buyers are involved in sub-stories. These sub-stories focus us on their goals and the key topics most relevant to what they are trying to solve or accomplish. Buyer Persona Scenarios: this modeling technique provides the context needed to understand how goals, activities, and sub-stories come together during a certain stage of the buying cycle. 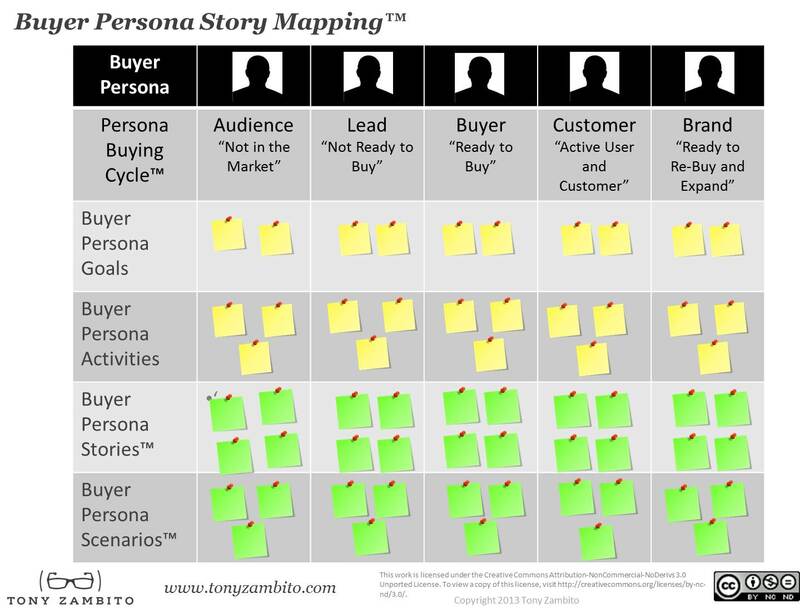 The Buyer Persona Story Mapping framework is designed for teams to work in collaboration. It provides a framework for discussion and brainstorming. To be efficient, it requires key insights, which come from buyer insight research and buyer persona development. It also should make evident how buyer personas in general have less to do with description and more to do with being a vehicle to understand buyers in practical ways. The intent of this series is to help marketing and sales leaders develop a path towards improving the effectiveness of their content marketing plans and strategy. Also, it is designed to bring more benefit to buyers, who are increasingly voicing their dissatisfaction with the volume of unhelpful content being shot-gunned their way. By getting teams focused on practical ways to understand the stories of buyers, you can do what has been part of civilization for many centuries – use content to tell a good story.